Studies have shown that adequate sleep is the strongest factor in the wellbeing and mental health of teenagers, and a shortage is linked to poor educational results, anxiety and obesity. However, UK principals say they are increasingly concerned about overtired children, both in secondary schools and the upper end of primary schools. This issue is not lost on experts, who say children are simply starting class too early. To combat the negative health effects associate with this, they say the start of the school day should be moved later, bringing them in line with teenagers’ biological rhythms. Scientific studies say that humans’ circadian rhythms – the body clock that manages the cycle of sleep and wakefulness – change in adolescence. The cycle shifts two hours in teenagers which means that they are wired to go to sleep and wake up later. The French education minister recently pushed back the start of the school day to 9am for students aged 15-18. 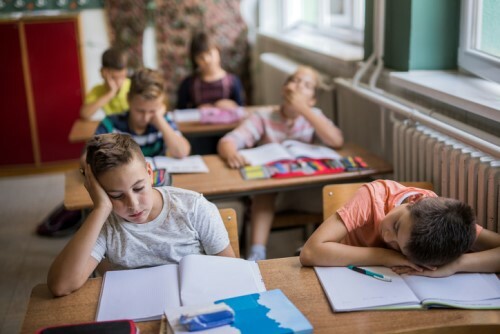 This followed a US study in December which found that by delaying the start of the school day by an hour can result in the “significant improvement in the sleep duration of students”. Dr Michael Farquhar, a consultant in paediatric sleep medicine at the Evelina children’s hospital in London, told The Guardian that it is as if adolescents are “in a different time zone” to everyone else. “We’re asking them to get up before their body clock is ready, because that’s the way the adult world works. So most teenagers end up sleep-deprived,” Dr Farquhar told The Guardian. Russell Viner, professor of adolescent health at University College London and president of the Royal College of Paediatrics and Child Health, said sleep is the “strongest predictor of wellbeing among teenagers”. “When we think about all the things parents worry about, the effects of sleep are about four times higher than the effects of smartphone use,” Viner told The Guardian.